The earliest information we have about the use of tea leaves is for medical purposes. Last but not least: makes one feel good. and conditions when tea is drunken, by whom and in what quantities, it is difficult to establish an unambiguous and sound proof. Polyphenols are the biggest and in health terms the most interesting group. They are responsible for the sometimes astringent taste and above all for the health benefits of tea. There are an estimated 30,000 polyphenolic compounds in tea. The most important group are flavonoids, with flavanols as the most prevalent. Flavanols (sometimes also referred to as tannins) are converted during oxidation to theaflavins and thearubigins—the compounds responsible for the dark colour and robust flavours in black teas. The major flavanols in tea are: catechin (C), epicatechin (EC), epicatechin gallate (ECG), gallocatechin (GC), epigallocatechin (EGC), and epigallocatechin gallate (EGCG). EGCG is the most active of these catechins and is often the subject of studies regarding tea antioxidants. 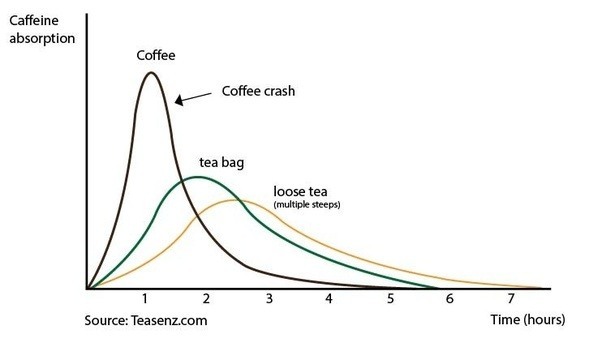 Tea leaves contain about 3%-5% caffeine. There is more caffeine in the tips and the first two leaves than in the other parts of the plant. Smaller tea grades, like Dust and Fanning in tea bags, release more caffeine quicker than the intact leaf. Unlike in coffee the caffeine in tea is slower absorbed by the human body and stimulates the central nervous system. This results in an increased brain activity, one feels concentrated and focused without the increased muscle activity one gets after coffee consumption. Black tea contains the highest amount of caffeine followed by Oolong, Green, White and Pu Erh. There are some exceptions to the rule. Since most of the caffeine and health benefits sit in the bud and the first two leaves of the plant other teas of high quality, for instance our White Bud, can contain almost as much caffeine than a black tea. Due to a change of lifestyle and eating habits there is an increased risk of heart diseases. Heart attacks are one of the most common causes of death today. “Epidemiological studies suggest that tea consumption is associated with decreased cardiovascular disease risk …” (Boston University School of Medicine, Boston, MA). Besides smoking, high blood pressure and high blood cholesterol are the main threats. By helping to prevent the cause for heart diseases tea is an affordable, natural and delicious way to keep your heart in shape. A lot of research, studies and clinical trials are being conducted to reveal the role of tea drinking in preventing cancer. In most cases researchers could establish a connection between the consumption of tea and the outbreak of cancer. It is not quite clear yet to what extend tea can fight cancer. It also seems that tea inhibits some types of cancer better than others (Mouth, oesophagus, stomach cancer – that is the way the tea goes through our body – those part come in closest contact to the tea). The earlier mentioned catechins contain a great amount of powerful antioxidants with anti-carcinogenic properties. Antioxidant neutralise free radicals which can cause unwanted mutation of healthy cells into cancer cells. This means that the catechins in tea are not a cure for cancer but may inhibit the formation or action of cancer causing substances. One study concluded that at the typical consumption of 3 cups a day tea has approximately the same antioxidant power as eating six apples. Another study found that one or two cups of (green) tea has the same ‘radical scavenging capacity’ as five portions of fruit and vegetables or 400 mg vitamin C equivalents. Tea contains substances with a high effectiveness against virus, bacteria and fungi. In China tea extract in a medicine is successfully used to counteract the loss of white blood cells through radiation therapy. 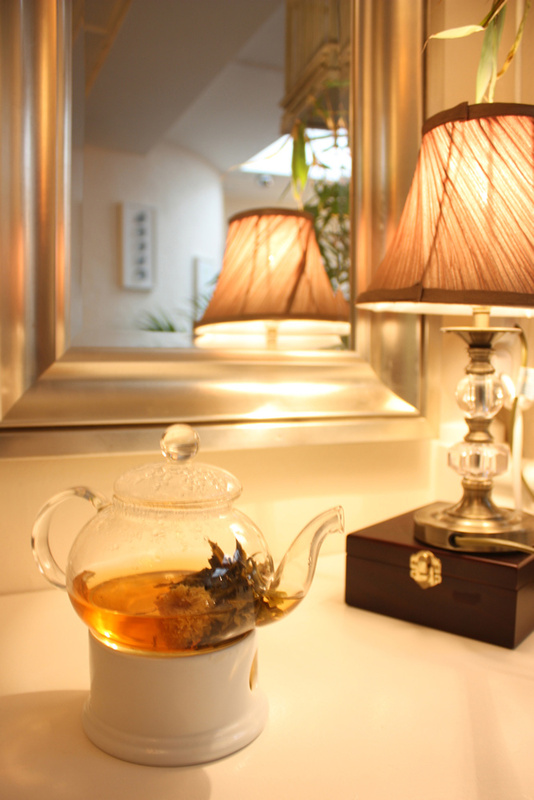 Green Tea also contains high amounts of vitamin C which is needed to strengthen our immune system. The mentioned polyphenols reduce the growth of plaque forming bacteria. They feed on a simple form of sugar and the tea inhibits the conversion from carbohydrate we eat into these forms of sugar (side effect is fresh breath). Tea also contains high amounts of fluorine. It strengthens the tooth enamel which protects the teeth from decay. Green tea reduces the acidity of saliva and accumulation of dental plaque, responsible for cavities. Two to three cups of green tea per day cover most of the needed fluorine for an adult. Most of us have been to Chinese restaurants and were offered Chinese tea after the meal. It is usually green Jasmine tea that is served which is not only quite delicious but also helps to digest the food you just ate. It is the substance called ‘saponine’ in the tea that breaks down and binds fat and prevents it from getting into the blood circulation. Tea provides relief to the stuffiness you might feel after a meal and soothes the process of digestion (herbs like peppermint and fennel have a similar relieving effect - see also our Wellness Digestion blend). Because of its alkaline nature, tea is a powerful remedy against high stomach acidity. We all know the unpleasant feeling when the acid gets into our oesophagus and causes heartburn (too much meat, ‘sour’ beverages like coffee, cola or lemonades, too much alcohol, eating too fast etc.). Tea helps to restore the right chemical balance in our stomach and as a result gets rid of the heartburn. This is also the reason why tea helps to prevent gastritis. The alkaline tea relieves the stomach of high acid concentration, relaxes the stomach walls and inhibits the growth of unwanted bacteria. The regulation of the acid level in our body is very important in many respects. Apart from skin and stomach our body should be slightly alkaline to function properly. Gastritis, heartburn, bad breath but also headache, weak immune system and fatigue can be signs for an overly sour organism. Drinking tea reduces the acid level in our body (stomach, uric acid) and it is also a suitable replacement for the main sinners like coffee and cola. In China, tea was always an ingredient of immortality potions which claimed to prolong a healthy life. Health benefits derived from tea like the reduced risk of heart disease or a stronger immune system contribute to longevity. Aging is the accumulation of damaged body cells which do not function properly anymore. This damage is caused by free radicals. Antioxidants bind those free radicals and neutralise them. Potent antioxidants like vitamins and polyphenols are abundant in tea and can slow down the process of aging. Tea is an ideal companion for every diet or fasting cure. Tea does not contain any calories or any fat. Instead it binds fat and prevents it from getting into the bloodstream. As a result it can help to reduce the fat in the tissues. First it suppresses the hunger feeling and reduces the appetite for heavy or sweet food which often is the cause for overweight. Secondly Pu Erh stimulates the liver metabolism which controls the accumulation of fat in the body (see also our Slimming blend). When changing eating habits or when on a fasting cure our digestion gets upset which can result in nausea, heartburn and fatigue. Besides the right food mix, tea is the ideal drink to go with it. It settles the stomach and the intestinal tract and reduces surplus acid. It helps body and mind to relax and is gentle but effective against tiredness and fatigue. The caffeine responsible for this, functions also as an diuretic. This helps to flush and detoxify the body. Tea, especially Pu Erh reduces the hangover symptoms in various ways. It stimulates the liver which is responsible to break down the alcohol in our blood (clinical trials have shown that the intake of Pu Erh can reduce the breakdown time by almost half). It provides a gentle caffeine kick to get on with life. Based on those qualities we have a special Hangover tea designed, to provide a helping hand when needed.